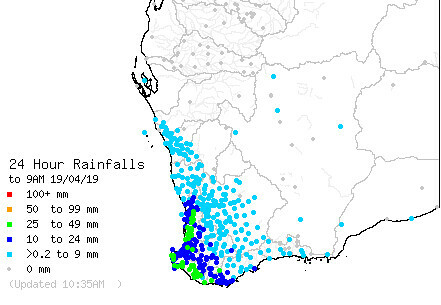 Good rains down the south west and southern W.A. Busso had a wild night and /morning with gusts up to 93km/hr and gale force for over 12 hours.Heaps of rain too MRiver had 48mms ..
Was supposed to be having a beachy day down here yesterday but the low fixed that up. Only 19deg here atm …..
Was in Denmark for a few days The day we left on the 29th the temp was only 15 deg at 11am and rainy . Perth got 37 today but nice cool easterly blowing atm. North West trough bringing lots of moisture down towards the south west. This sounding tells it all. Absolute cracker of a cold front forecast for Friday. Colder than any front last year from what I remember. Sub 530 thickness and - 3 to - 4 850s would be snow on any mountains above 500m. Looking forward to any reports from anyone on the weekend! Strong cold front with associated low came through the south starting about midnight last night . Lots of rain , cold air and wind.Dwellingup 8.7deg this morning at 1050am also Perth 12.6 same time. 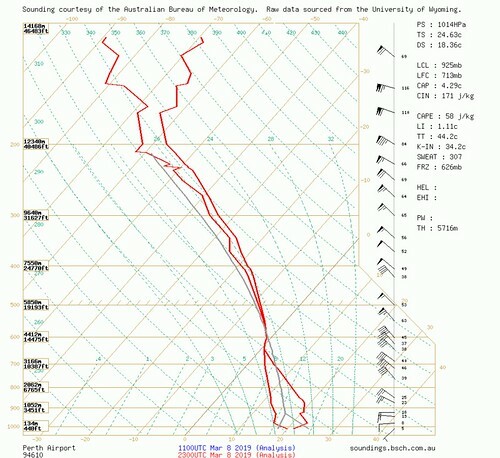 Rottnest recorded 91km/hr SW winds at 1am and Cape Leeuwin 93km/hr WSW at 6am. Its cold down the south of W.A today . Bridgetown 7.5deg at lunchtime and same time Walpole 6.8 deg. So Albany Airport AWS fails on its big day. Widespread rain persisted into last night and this morning albeit light falls in most parts except the lower south. 6 registered (Snapper22lb, mysteriousbrad, Homer, Teddy, 2 invisible), 54 Guests and 3 Spiders online. Generated in 0.064 seconds in which 0.054 seconds were spent on a total of 14 queries. Zlib compression disabled.